This week was highlighted by the promotion of Lucas Giolito to the majors, but that was not the lone transaction that reshaped the Washington Nationals organization. On Monday, the team announced several high-profile promotions within its minor league ranks, including Reynaldo Lopez and Chris Bostick to Triple-A Syracuse, Drew Ward and Andrew Stevenson to Double-A Harrisburg, and Victor Robles and Max Schrock to High-A Potomac. The promotions were not a surprise. Every player performed well enough at his previous level to warrant the move and they, in some way or another, are in the picture for eventual roles in the majors. Ultimately, the biggest move may very well be that of Lopez to Syracuse. 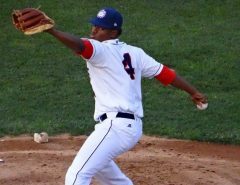 In what is in some respects a make-or-break year for his development as a starter, Lopez has answered the challenge, overcoming a slow start at Harrisburg to dominate in the Eastern League. The right-hander fanned 100 batters in 76 1/3 innings pitched, while walking just 25 and posting a 3.18 ERA. In his first start at Syracuse on Thursday night, Lopez allowed one run on three hits over six innings pitched, while walking four and striking out four. He now has 82 1/3 total innings on the season. At this rate, Lopez is going to shatter his previous personal best for innings in a season, which was set at 99 last year in Potomac. Therefore, it will be interesting to see how the Nationals handle him over the remaining months. While his talent and proximity to the majors make Lopez a legitimate option for a September call-up, it would not be a complete shock if the Nationals erred on the side of caution and let him finish the season in the minors to manage his innings. Regardless, he is now on the doorstep of the majors and in the running for a roster spot by 2017. Among the other promotions, those of Stevenson and Robles — a pair of centerfield prospects — say a lot about the organization’s depth. Most would agree that Robles is the superior of the two players, but Stevenson continues to justify the Nationals’ decision to make him their top choice last year. At Potomac he displayed an improved swing en route to .305/.359/.418 triple-slash line while using his impressive speed to steal 27 bases in 36 attempts. Various reports have mentioned Stevenson as a prospect the Nationals could move should they seek help at the deadline. Having Robles — who, as one of baseball’s top prospects, is one of the organization’s least likely trade candidates — behind him would ease the loss, but the Nationals should still not take consideration to trade Stevenson lightly. He has shown impressive strike zone judgement thus far, and has the makings of a strong defensive centerfielder with elite range. The moves of Ward and Schrock were inevitable. Ward was showing improved strike zone judgement and increased power upon his return to Potomac, while Schrock proved to be well ahead of his competition in the South Atlantic League. 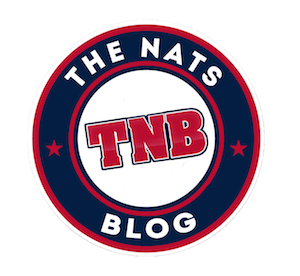 Both face questions about whether they can stick at their respective positions — Ward at third base, and Schrock at second — over the long run, but the Nationals can bide their time with a decision as both players round out solid offensive seasons. Bostick, meanwhile, was added to the 40-man roster over the offseason. With his ability to play the infield and the outfield, his versatility may make him an intriguing candidate for a September call-up. As is standard in most minor league seasons, look for more promotions to occur over the remaining months. Yet, this series of transaction is most likely to prove of any over this season to reshape the farm system. Schrock went 3-for-5 with an RBI in Potomac’s 5-3 win over Myrtle Beach (Chicago Cubs) on Thursday. Entering Friday’s action, he is 8-for-15 (.533) with a home run over his three games at Potomac. Three Harrisburg Senators—right-handers Tyler Mapes and Andrew Robinson, as well as infielder Neftali Soto — were selected to the Eastern League All-Star Game. The game will be played in Akron on July 13.